For the longest time, I have avoided the Chicago Cocktail. Mostly because I have never had a good one. It is one of those cocktails that you see on menus of newly opened places that have no soul. The new bar manager who was waiting tables a year before thought it was a good idea to dig this one out of his reprinted copy of an old book. For some reason people order it... but mostly send it back. Flat Champagne and temperature are the usual culprits. Also, making a drink that is all booze too boozy is often times the other. It can surely be done correctly but rarely by a novice. CHICAGO COCKTAIL: Fill the mixing glass half full of broken ice, add one or two dashes of Angostura Bitters, three dashes of Curaçao and one-half a gill of Brandy. Stir well, strain into cocktail glass, add an olive or cherry, squeeze a lemon peel and drop it into the glass, and pour a little Champagne on top. Before straining the mixture into the cocktail glass, moisten the outside borders of the glass with lemon juice and dip into pulverized sugar. The Chicago Cocktail can also be found in the 1930 Savoy Cocktail Book, on page 45, sandwiched between the Cherry Mixture Cocktail and the Chinese Cocktail. I would avoid both entirely. I just prefer the way Mr. Drury describes it. I like my drinks with a bit of description. After reading the recipes over a few times I realized that when I ordered a Champagne Cocktail at Bar Hemingway in Paris last month I got a surprise Chicago Cocktail instead. While Colin was busy talking to whom I assume was a model or royalty about the Martini-Henry rifle over the bar, Joris the bartender made me his rather interesting Champagne Cocktail on my request for a drink after the brilliant Martini I had finished. I like some bubbles after a Martini to make sure that it works. He knew I was from Chicago because of the chat the night before and I wonder if he pulled this ace from his sleeve to show that he had figured out how to make a fantastic Chicago Cocktail. He didn't follow Mr. Drury's recipe to the letter but what good bartender does? He also did the mixing in the turned over top of his large two piece Parisian shaker (of course). 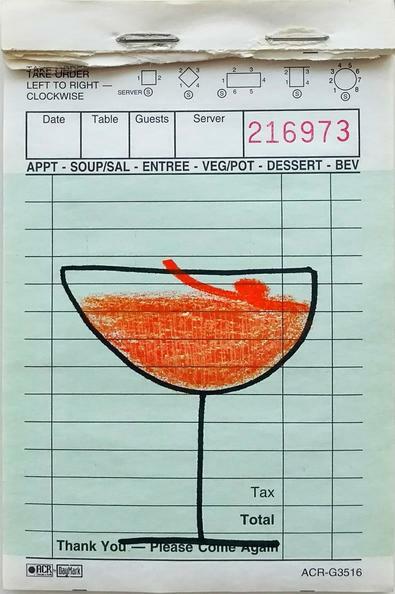 I found that interesting and it seemed that if caster sugar was ever being added (I never once saw a bottle of simple syrup during the three trips I made to the Hemingway) it was done either in the glass the drink would be served in ie. Old Fashioned, Tom Collins etc., or in the top end of the shaker and then stirred or built regularly in the big end and shaken like a Daiquiri, White Lady, etc., depending on the drink. Spirit only stirred drinks that contain no sugar got their usual time in a crystal mixing glass, or came straight out of the freezer like the Martini I enjoyed before. Stir this around to dissolve the sugar. Strain into a large chilled coupe. Fill slowly with ice cold Champagne. Express and garnish with a small piece of orange peel. Note: The stirring with ice is not intended to be serviceable on its own. It is only meant to chill the mixture so that when the bubbles are added (and hopefully dilutes the mix to perfection) it doesn't shock the drink and expend the precious carbonation. Note: Pay attention to how you place the orange peel in the glass after expressing the perfume. Skin up produces less bubbles for some reason than it does if you are showing the belly of the peel. Try never to be belly up while drinking cocktails. Note: Don't skimp on the quality of Champagne in this drink or you will ruin it. As a matter of fact--don't skimp on Champagne period. Drink it often and go for the good stuff. Life is too short. The Champagne Cocktail is a style of cocktail more than an individual drink. It took a trip to France to convince me that the Chicago Cocktail should be added to my short list of drinks worth looking at deeper, and to the shorter list of Champagne Cocktails worth drinking.